Question: If you were to pour a pound of molten lead and a pound of molten iron, each at the temperature of its melting point, upon two blocks of ice, which would melt the most ice, and why? Answer: This question relates to diathermancy. Iron is said to be a diathermanous body (from dia, through, and thermo, I heat), meaning that it gets heated through and through, and accordingly contains a large quantity of real heat. Lead is said to be an athermanous body (from a, privative, and thermo, I heat), meaning that it gets heated secretly or in a latent manner. Hence the answer to this question depends on which will get the best of it, the real heat of the iron or the latent heat of the lead. Probably the iron will smite furthest into the ice, as molten iron is white and glowing, while melted lead is dull. A pound of energy with an ounce of talent will achieve greater results than a pound of talent with an ounce of energy. In Getting on in the World; Or, Hints on Success in Life (1873), 55. An ounce of pretension is worth a pound of manure. In Robert Harling, Steel Magnolias (1988), 18. The play was first presented on 22 Mar 1987. Perhaps an older adage, but an example of its use appears in Pennsylvania Gazette (4 Feb 1734-5), about fire prevention, including taking care, moving live coals from a fireplace between rooms, for safety in a closed warming-pan. A midnight fire from a spilled ember might set your stairs on fire: “You may be forced, as I once was, to leap out of your windows, and hazard your necks to avoid being over-roasted.” As cited in Benjamin Franklin and J. Sparks (ed. ), The Works of Benjamin Franklin (1840), Vol. 1, 134, footnote. 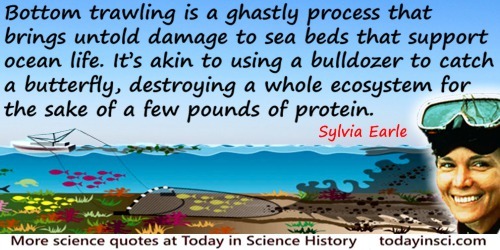 Bottom trawling is a ghastly process that brings untold damage to sea beds that support ocean life. It’s akin to using a bulldozer to catch a butterfly, destroying a whole ecosystem for the sake of a few pounds of protein. We wouldn’t do this on land, so why do it in the oceans? As quoted in Joseph Wickham Roe, English and American Tool Builders (1916), 49. He [Lord Bacon] appears to have been utterly ignorant of the discoveries which had just been made by Kepler’s calculations … he does not say a word about Napier’s Logarithms, which had been published only nine years before and reprinted more than once in the interval. He complained that no considerable advance had been made in Geometry beyond Euclid, without taking any notice of what had been done by Archimedes and Apollonius. He saw the importance of determining accurately the specific gravities of different substances, and himself attempted to form a table of them by a rude process of his own, without knowing of the more scientific though still imperfect methods previously employed by Archimedes, Ghetaldus and Porta. He speaks of the εὕρηκα of Archimedes in a manner which implies that he did not clearly appreciate either the problem to be solved or the principles upon which the solution depended. In reviewing the progress of Mechanics, he makes no mention either of Archimedes, or Stevinus, Galileo, Guldinus, or Ghetaldus. He makes no allusion to the theory of Equilibrium. He observes that a ball of one pound weight will fall nearly as fast through the air as a ball of two, without alluding to the theory of acceleration of falling bodies, which had been made known by Galileo more than thirty years before. He proposed an inquiry with regard to the lever,—namely, whether in a balance with arms of different length but equal weight the distance from the fulcrum has any effect upon the inclination—though the theory of the lever was as well understood in his own time as it is now. … He speaks of the poles of the earth as fixed, in a manner which seems to imply that he was not acquainted with the precession of the equinoxes; and in another place, of the north pole being above and the south pole below, as a reason why in our hemisphere the north winds predominate over the south. Meat reared on land matures relatively quickly, and it takes only a few pounds of plants to produce a pound of meat. Tuna take 10 to 14 years to mature, require thousands of pounds of food to develop, and we’re hunting them to the point of extinction. The French kilogramme = 15,433.6 grains, or 2.679 lbs. Troy or 2.205 lbs. avoirdupoids. These white crystals is what’s left of the human body when you take the water away, which makes up 96% of our bodies. Without water, we’re all just three or four pounds of chemicals. In TV episode, spoken by character Dr. McCoy, 'The Omega Glory', Star Trek (1968). In 'Sir Isaac Newton', People’s Book of Biography: Or, Short Lives of the Most Interesting Persons of All Ages and Countries (1868), 255. When first discovered, [aluminum was a precious metal that] cost about 270 dollars a pound; then it fell to 27 dollars, and today a pound of aluminum is worth about nine dollars. Answering the question, “Is not aluminum rather expensive?” to a fictional moon shot committee. In Jules Verne, Aaron Parrett (ed.) and Edward Roth (trans. ), From the Earth to the Moon (1865, 2005), 50. In the original French edition, the costs were given in francs as about 1500, 150 and 48.75, respectively.